Cha-lyb-e-ate (ke lib'e it, -at'), adj. 1. containing or impregnated with salts of iron, as a mineral spring, medicine, etc. - n. 2. a chalybeate water, medicine, or the like. 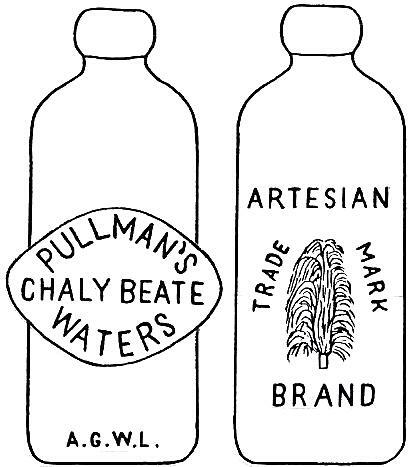 Pullman bears the sobriquet of the "Artesian City," by reason of the excellent artesian water which has been lately discovered, and which affords a never failing supply for the extensive system of water works. About a dozen of these wells are at present flowing in the city. The water of course is absolutely pure, as is evidenced by the fact that chemical analysis shows it to be strongly impregnated with iron. Messrs. Thompson and Neill have constructed a large public swimming bath where the visitor may enjoy the peculiar health giving properties of these famous waters. The main well produced 3,000,000 gallons of water per day. 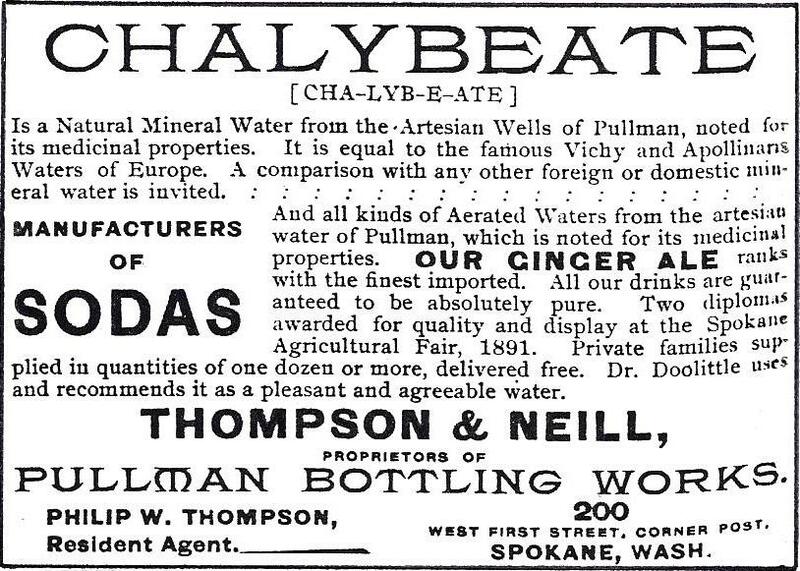 Pullman's Chalybeate Waters were popular enough for Thompson and Neill to open a retail outlet in Spokane, but it must not have been a financial success, as this was a very short-lived venture. Thomas Neill later became a judge. WA0099 is, to the best of our knowledge, the only known Hutchinson bottle bearing an embossed picture of a spouting spring. The illustrated bottle was discovered 30+ years ago by a Northern Idaho farmer while plowing, resulting in the slightly damaged top. We are aware of only one other example of this Rare bottle.